Chicken fried steak (also known as pan fried steak, country fried steak or CFS) is a piece of steak (tenderized cube steak) coated with seasoned flour and pan fried. It is associated with Southern U.S. cuisine and hospitality. Left: Chicken fried steak, served with country gravy and baked beans. 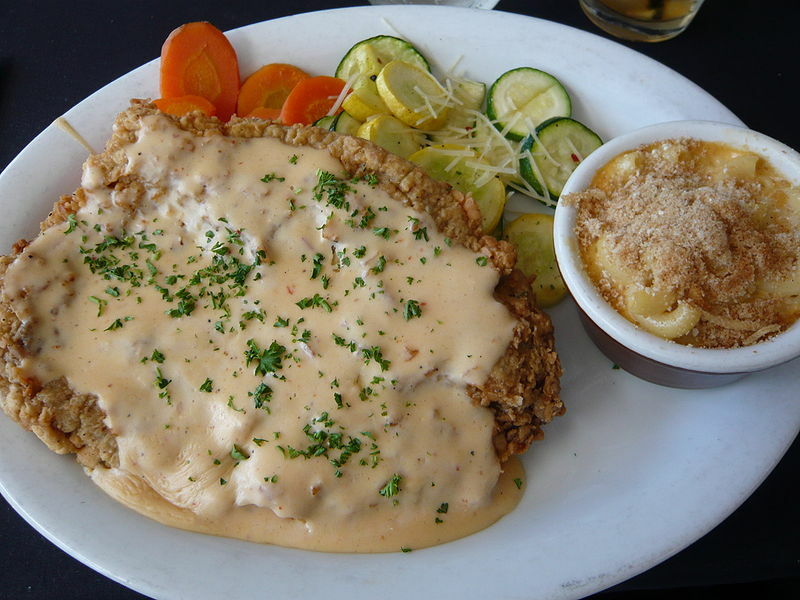 Its name is likely due to chicken fried steak's similarity in preparation to fried chicken, though the dish is also similar to the classic Viennese dish Wiener Schnitzel (known in Latin American cuisine as milanesa), a tenderized veal or beef cutlet, coated with flour, eggs, and breadcrumbs and fried. It is generally categorized as a comfort food. The precise origins of the dish are unclear, but many sources attribute its development to German and Austrian immigrants to Texas in the nineteenth century who brought recipes for Wiener Schnitzel from Europe to the USA. 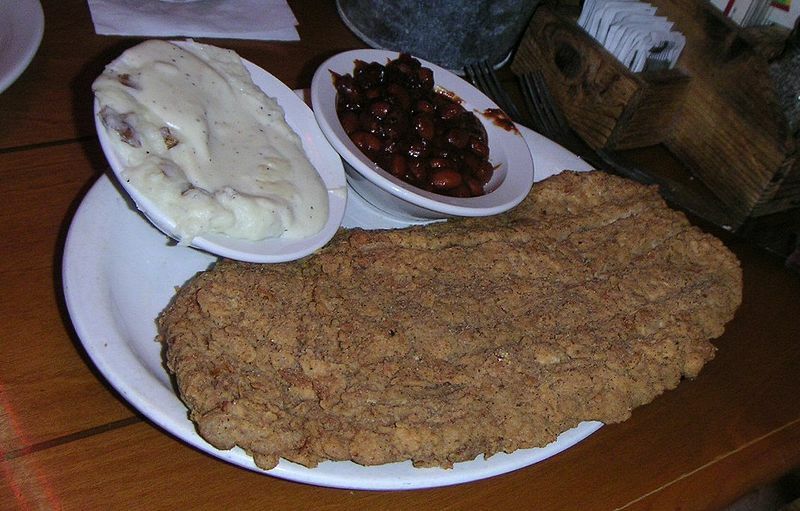 Typically, in Texas and surrounding states, chicken fried steak is deep fried in a pan and served with traditional peppered milk gravy. Often there is a brown gravy, and occasionally the meat is either pan fried with little oil, or simmered in the gravy. Left: Chicken fried steak with chipotle cream gravy. Other meats may be used, with chicken fried chicken having appeared on many menus substituting a boneless chicken breast for the steak. The dish known as "chicken fried chicken" differs from the dish known as "fried chicken" because the meat is removed from the bones, and cooked in the fashion of chicken fried steak. Another term is steak fried chicken. Boneless pork chops, usually center cut, are served in this manner, as well as beef cutlet (tenderized round steak), buffalo, or boneless chicken breasts.